SAAB management first began thinking about the design for an entirely new car in the 1970s but the same financial constraints that precluded development of a new engine delayed any serious design work.� Of course, SAAB were not the only manufacturers concerned about the enormous costs associated with the design and introduction of new models and eventually this resulted in a quadripartite alliance of makers in a venture that became known as the Type 4 project. 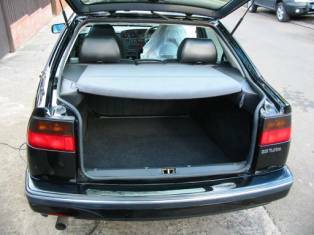 Alfa-Romeo, Fiat and Lancia were SAAB’s partners in the Type 4 project and the principal objective was to reduce costs by using a number of common parts.� Alfa �Romeo�s 164 was styled by Pininfarina but the Fiat Croma, Lancia Thema and SAAB 9000 were all the work of design studio Giugiaro Italdesign.� Differences of opinion between engineers led to friction and ultimately, very few components were interchangeable between models. When it was first introduced (1986), motoring journals perceived the SAAB 9000 to be an accomplished executive car with spacious accommodation and admirable build quality.� Buyers were sufficiently impressed to countenance long waiting lists for the new car but this was entirely understandable, as SAAB philosophy is based on iterative refinement of existing designs, rather than copying other makers who see fit to introduce a new model every 4-5 years or so.� Indeed, in 1987, one commentator jokingly said that it was very likely that buyers would have to wait patiently until 2001 before SAAB would introduce another new design! 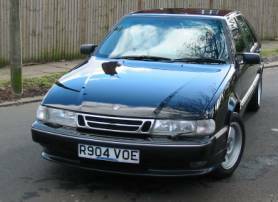 Today, the 9000 range represents excellent value for money, as even the youngest cars are now four years old and many will have racked up impressive mileages.� Traditionally, SAAB cars have quite steep initial depreciation – one dealer stated that this was largely because trade price guides were compiled from auction data and values reflect higher than average miles the cars could achieve in a year.� Whether this is true or not is irrelevant – depreciation makes SAABs an excellent proposition for the second hand buyer. 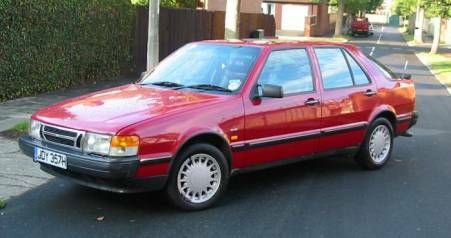 Above: the original �flat front� shape 9000.� This car is a 1990 2 litre Turbo manual. 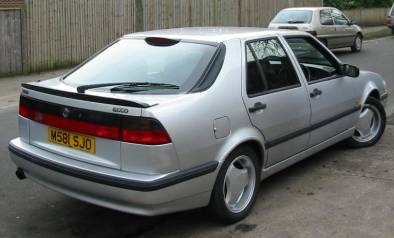 The SAAB 9000 made its UK debut in turbo charged 2 litre 5-door hatch back form in late 1985.� By the expedient of adopting a transverse engine layout, engineers succeeded in offering better accommodation in a car that was slightly shorter than the old 900.� Indeed, the internal dimensions satisfied the American EPA criteria for ‘Large cars’ – the only other imported car to fall in this category was the Rolls Royce. Equipment levels were par for the class with the 9000 range: plush velour trim was standard, although leather seat facings were a popular extra cost option.� Alloy wheels were standard with turbo charged cars and electrically adjusted door mirrors (the mirror lenses are electrically heated) were fitted to normally aspirated cars too.� Not all cars shipped with electric windows to all four doors – the author has seen a few early cars with manually operated windows all round.� When all doors have the power window option, a switch is provided to disable the rear window lifts – this can prove a boon when transporting inquisitive youngsters!� Whereas makers like Mercedes-Benz and Audi favour vacuum actuation, SAAB used electrically operated central door locking for the 9000 range.� This system also secures the petrol filler door when the doors are locked.� A pictogram on the instrument panel provides a visual warning when doors or tailgate are not properly closed. 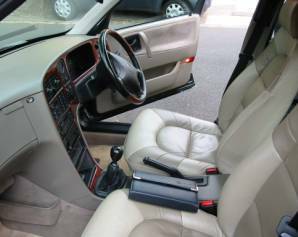 Improvements introduced during 1987 comprised provision of seat heaters and more significantly, ABS brakes (as an extra cost option), whilst a ZF 4-speed automatic gearbox was offered for the first time. With a growing list of options, SAAB decided to target the UK market with an SE variant of the Turbo hatchback in 1988.� Since this model was not offered elsewhere, the author believes it seems reasonable to suppose that it was aimed fair and squarely at owners who still hankered for traditional English trim, as epitomised by makers such as Humber, Rover and of course, Jaguar.� Seating in the 9000 is a strong point, as the design is said to have been influenced by orthopaedic specialists.� Support is nothing less than superlative but when leather facings and electric adjustment is provided too, the effect is enhanced.� The really distinctive part of the SE package, though, was the walnut door cappings, console and fascia.� With climate control as standard, the cabin had an unmistakable air of opulence. some models.� With air conditioning, the same rotational dial controls are carried over from non-a/c equipped cars and the air conditioning is actuated by a push button switch marked with an ice crystal icon.� Throughput is governed by the ventilator blower fan.� By comparison, climate control is more sophisticated, and the switch panel is correspondingly more complicated.� By default, the system is on, maintaining a cabin temperature selected by the driver, although an economy mode and off button is also provided.� When CCS is fitted, the heated rear window and rear door demister controls are incorporated in the button array. 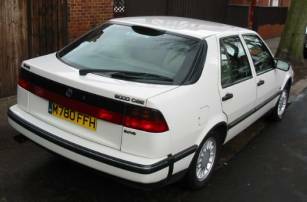 An alternative body style appeared in 1989, in the form of the CD, a booted 4-door saloon.� It is possible that the SAAB marketing team were concerned that potential sales were being lost because buyers seeking a traditional saloon may have preferred instead offerings from Mercedes Benz or even Ford’s Mk III Granada. When the CD saloon became available, buyers were also offered a larger displacement 2.3 (2290cc) engine (still 4 cylinder) which was fitted with 2 balance shafts, in the interests of extra refinement.� Initially, cars could be had with the 2.3 turbo-charged engine only.� With a pair of camshafts and two balance shafts, the engine designation B234 makes perfect sense.� This engine was fitted with direct ignition from the outset, which dispensed with the need for a distributor and ignition leads.� With this system, each cylinder has its own coil pack contained within the red coloured Direct Ignition unit which is fitted directly to the spark plugs.� Eventually, this ignition system was applied to 2 litre engines, starting with turbo charged models. From 1988, a special high performance version of the 9000 turbo was introduced in the form of the Talladega, which was built to commemorate the endurance records set by three standard turbocharged SAAB 9000s at Talladega Speedway in the US.� In total 19 new international records were set.� In the UK alone, the Talladega was marketed as the 9000 Carlsson.� A trifle brash for some tastes, this model used a revised ecu with revised programming to allow higher boost pressures and a different ignition advance curve.� A twin tailpipe exhaust completed the engine modifications that produced an additional 20 or so BHP. Externally, the Carlsson made its presence felt with colour coded wheel arch mouldings, colour coded sill extensions and bumpers, together with a less than understated tailgate spoiler.� The external appearance is very much an acquired taste but inside the cabin, differences are confined to the fitment of a stylish leather bound Momo steering wheel.� All the cars I have seen have been fitted with air conditioning and some have had suede seat inserts in the sides of the leather facings.� Carlssons should be fitted with 16” alloys: either the crosswire style or the more desirable dished, two tone super aero style so beloved of enthusiasts.� Early Carlssons will invariably be fitted with the 2 litre turbo engine but later sloping front hatches could have the 2.3 (B234) engine fitted, probably with SAAB Traction Control System (TCS) and anti-lock brakes (ABS).� Specialists reckon the saloon version of the Carlsson is quite rare.� Officially, the Carlsson was only available in white, graphite metallic, red and black.� Automatic transmission was not a popular option with this car and the author has seen but one example so equipped! For the 1991 model year, hatchbacks received the same aerodynamic sloping front that the CD saloon had been fitted with since its introduction.� A number of normally aspirated models were also sold with XS specification, which usually offered drivers extra value for money option packs that came in just beneath the company car tax threshold. 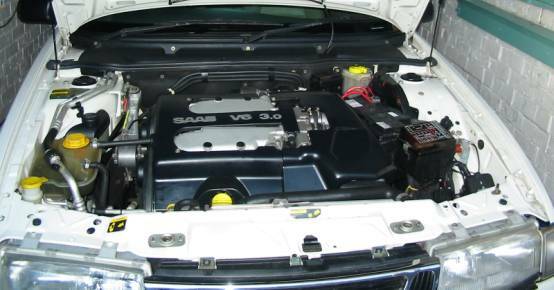 3-litre V6 CSE auto: the car on the right is a 1997 fpt 2.3 Turbo manual. As a styling exercise, it was an object lesson in achieving an entirely new, contemporary look without the need for retooling the entire production line.� Inside the cabin, changes were confined to resiting the hazard light switch and redesigning the window switch gear in the centre console.� The remote boot release button that appears in the driver’s door card became standard with the new models.� Air bags started to appear in steering wheels soon after, though not all cars had them as standard.� These new shape hatches were offered in CS (standard trim) and CSE guise.� Engine choices were as before but gearboxes were revised for a slicker change about this time. Turbo charged 2.3 cars in CS form with TCS could look surprisingly innocent without alloy wheels – only the discreet turbo badge on the front grille gave the game away.� As a rule, CSE models were better equipped, with the majority of cars having a climate control system (CCS) and alloy wheels.� By now, the standard alloy wheels sometimes known as teardrops (because cleaning is fun?) but more properly known as short spokes had given way to an anodyne, 3 spoke directional wheel which did not meet with universal enthusiasm. Below Left:� CSE fascia layout is little changed from earlier cars but note airbag equipped steering wheel.� The luggage boot (Right) can be made larger still by folding the rear seats. For a while, elements of the Carlsson continued in much more subdued form before a new, quicker CS Turbo variant was announced for the 1993 model year.� The new CS Aero was more discreet than the Carlsson models, although it featured a colour coded tailgate spoiler, wheel arch mouldings and different bumpers and sill covers. Below: the 225bhp CS Aero.� Note wrap around bumpers, sill extensions and black moulding inserts that run along the flanks and through the bumpers.� The silver car has been debadged and has standard seats whereas the blue car (Right) retains the dscreet Aero decal and optional Sports seats. 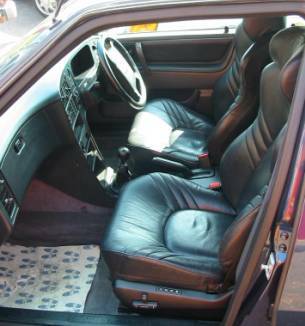 in 1993, an Aero with the optional Sports seats cost over �32,000.� Whereas the figure hugging sports seats offer superb support and keep occupants in place, even during fairly spirited driving for which the car is designed, it must be conceded that some of the versatility is lost, as the capacity to accommodate three rear seat passengers is compromised. 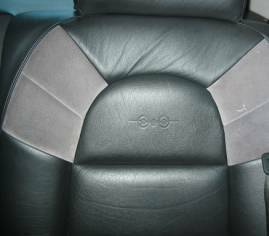 Below: supportive Sports seats in the Aero but note the deep divide between the rear cushions.� Not all Aeros have Sports seats, although the feature was standard on later cars. While the hatch continued in revised form as the CS, the saloon soldiered on unchanged until the same frontal treatment was applied for 1994 model year cars.� The effect was not entirely successful because overall, it was only half a makeover and aside from reworked rear lights, the rear of the car looked very similar to previous models. 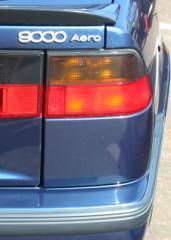 After 1994, the 9000 CS and CD continued virtually unchanged until production ceased in 1997, although a few vehicles were not registered until 1998.� A light pressure turbo charged engine (known as the Eco or LPT) was announced that bridged the gap between normally aspirated and full pressure turbo cars.� These engines benefited from a lower insurance loading, whilst offering more power without any turbo lag.� Such models are easily identified as they do not have a boost gauge on the dashboard.� The popularity of the light pressure turbo was such that by 1996, the normally aspirated engine models were withdrawn.� To confuse matters, at some point in the mid ‘90s, the tag Eco was applied to all models, irrespective of whether the LPT or full pressure turbo engine was fitted. 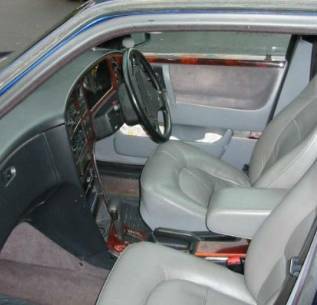 Inside the cars, some owners were disappointed when passenger airbags appeared, as this meant the loss of that useful and capacious lockable glovebox.� In its stead, a pocket was fitted to the centre console.� More observant owners who had owned 9000s previously would detect signs of penny pinching and blame General Motors ‘bean counters� for the deletion of the useful under bonnet lamp.� They might also note that there was considerably less carpet beneath the rear seats on the CS & E models than on previous cars. 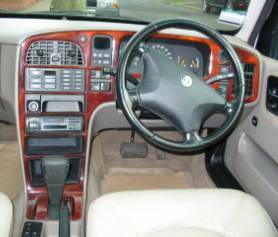 The XS specification varied slightly from year to year but consultation of the 1995 model year brochure confirms the availability of 4 option packs.� Option packs 1 and 2 combined either air conditioning or full automatic climate control with alloy wheels, driving lamps and leather bound steering wheels and gear knobs.� A further two packs were also offered in the form of ‘comfort’ or ‘driving’.� The former offered leather seat facings with the SAAB car computer and cruise control whilst the latter was more basic, providing just cruise control and the car computer. Engine blocks and transmissions altered about this time too, in a move intended by GM to promote standardisation across the entire product range.� Engine management systems changed also in a move that was to cause complications for repairers later in the vehicles’ lives when it would be discovered that earlier parts could not be adapted to fit. The range�s swansong was the Anniversary, so named because it coincided with the maker�s 50th Anniversary.� Engine options remained unchanged, with cars being offered with either of the light pressure (LPT) engines rated at 150 and 170 bhp respectively or the 2.3 FPT (200bhp).� Smart new 8 spoke alloys complimented the Aero style body-kit that included colour coded wrap around bumper covers, sill extensions, front and rear spoilers and wheel arch mouldings.� The side mouldings on the doors and front wings had black as opposed to the normal chrome effect inserts, in common with Aero and CS Carlsson variants.� A special steering wheel with wood inserts gave the cars a special feel whilst leather seat facings in either rocky black (suede inserts) or sand beige (alpaca inserts) were standard, along with textile over mats.� Reflecting the maker�s aviation connection, seat backrests were embossed with the SAAB aeroplane logo.� Colour choice was restricted to Black, Scarabe green, Midnight blue, Amethyst violet or Imola red. 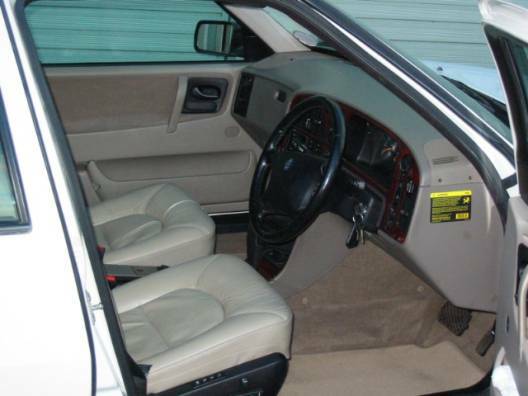 Above: Anniversary models had either Sand beige or Rocky black interior trim.� Note embossed logo. Don't rule out non turbo cars - these can be surprisingly economical on long distance work and will cost less to insure, too.� From a DIY maintenance perspective, these cars make most sense of all, being much easier to work on because the engine bays are less cluttered. After running both the saloon and hatch models from various model years, the author is convinced that the saloons, for all their slightly ungainly looks are probably most refined although load space in the hatch is simply unbeatable.� Ultimately, it would be a mistake to focus on one particular model to the exclusion of all others.� It is wiser by far to make a decision based on condition, rather than year or style and it may well be necessary to travel! The 9000 range when new was held in high regard as an executive model from a prestige car maker.� As such, the 9000 can be fitted with a host of complex optional equipment.� Many cars will have been subject to loving care and sympathetic driving but others will have been soundly thrashed.� Sorting the tired cars from better examples may seem daunting but need not be as difficult as expected, even for the novice. 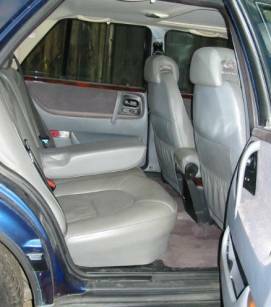 ����������� is a 1994 9000 CSE V6 with optional� leather seat facings and electric memory adjustment. One very good but not infallible indicator of a car's general condition is the state of the interior.� Clean, unscuffed seat facings and door cards usually point to the fastidious owner who will have been equally attentive to servicing.� Check the toolkit (located on the driver’s side of the luggage boot) is complete - it should be there on a car with good service history.� If it isn't, worry about the competence of anyone who hasn't even the basic kit that ships with the car or failed to replace it after emergency use. 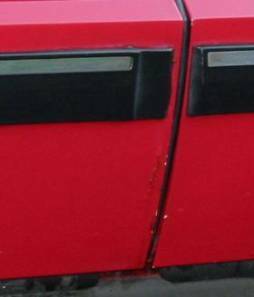 Rust should not be a serious worry and checking is easy.� Much of this is common sense - avoid anything with really tatty bodywork: stone chips are a sign of honest work but rust spells neglect and possible poor quality body repair work after an accident.� Earlier pre-1990 cars can suffer from serious rust in the roof panel, especially if a sliding sunroof is fitted, so check carefully for any signs of bubbling or blistering because an effective repair is time-consuming, ergo expensive.� .� Doors on pre CS models too can suffer to the point that the bottoms can resemble lace curtains.� This is often due to water being trapped in the door bottoms, sometimes due to blocked drain holes.� Repair is possible but please note that the drillings for the fasteners for the body mouldings vary between considerably between variants and check strap design varies if used doors are to be acquired!� This means that later CS doors can’t be fitted easily to flat front models without work. 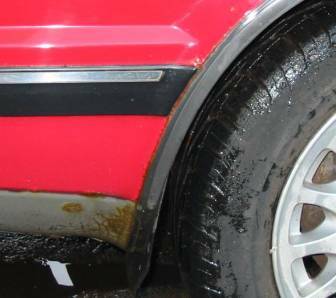 Above:� check ALL models for rust blisters in the door bottoms (Left) and the rear wheel arch bottom aft of the rear wheel where mud collects.� Circled areas are rust �hot spots�. Headlamp lenses are not cheap but are at least available although second-hand ones can cost up to �30 each.� With CD models and facelift pre CS hatchbacks (1991-2) do check that the top leading edges of the combined front indicator sidelamp units have not been damaged by careless closing of the bonnet. Whilst examining the exterior of a car, bear in mind that some models have a reflective d�cor panel, sometimes referred to a tail blazer.� This item is very susceptible to fading on early cars but all models are prone to cracks, chips and less than careful reversing manoeuvres.� Replacement is frighteningly expensive – allow �75 even for a good used unit from a breaker’s yard!� On all models ensure that ham fisted mechanics have not forgotten to refit the front (2-piece) inner wheel arch liners, as this will leave the front wings exposed to road grime and salt during the Winter months. 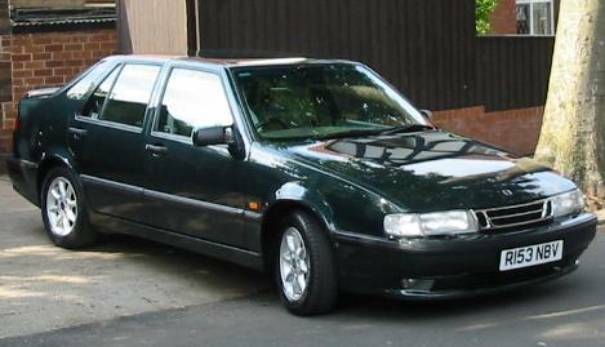 Below: not all cars will have unmarked coachwork like this exceptional FSH 2 owner 80,000 mile 1997 Anniversary in Scarabe Green.� Note the 8-spoke alloys and Aero style bodykit. Running gear is generally robust but many cars have covered large mileages and there are several potentially expensive problems that can be avoided.� A full SAAB dealer (or specialist) history is almost essential, particularly with automatic cars, where the gearbox MUST be drained and have its filter changed at least every 24,000 miles to avoid expensive problems later.� Checking the fluid level and colour on the gearbox dipstick will reveal little about the overall condition of the autobox.� Instead, the car should be driven at least ten miles, as ‘boxes sometimes loose drive when the fluid gets warm.� Upshifts should be smooth and it should be possible to select drive and reverse from the Park position (when stationary with the foot on the brake) without the car jerking violently.� There should not be any delay more than a second between selecting D or R with the lever – more than this indicates a problem. Manual gearboxes sometimes prove troublesome too – beware of difficulty in selecting reverse gear (1994 on cars in particular) and general noise (all years).� Cars with tired clutches are not cheap to fix, as the clutch slave cylinder is positioned inside the gearbox.� It is worthwhile checking vendors have not left tins of brake fluid in the luggage boot and a glance under the gearbox for damp patches is worthwhile, as fluid leaks can escape from the rubber plugs in the gearbox base. Be advised that the 9000 engines have timing chains, rather than toothed belts and these can and do wear from 70,000 miles.� Beware noisy chains that are audible on tickover when the engines is warm!� Very regular oil changes at 6000 mile intervals help minimise wear - the bits alone will cost around �400 to renew the chains, guides, gears and tensioners.� My message is... you can buy an AWFUL lot of oil for �400, so don't let it happen!� The author has sold recently a very fine 1993 9000CDE 2.3 Turbo - at 158,000 miles the chains are untouched and silent: testimony to the previous owner’s attention to servicing and careful driving. The 9000 is a strong car but design focussed on protecting the passengers.� In a frontal impact crash, damage is often transmitted through the bumper to the chassis legs and door aperture.� Tell tale damage to the centre of the roof is virtually impossible to repair and another giveaway is difficulty in closing or opening doors.� For this reason it is almost essential to use a company like HPI to check that the vehicle is not listed on the VCAR (vehicle condition alert register) after a serious accident. It is a very good idea to check all the electrical equipment works.� Cars with TCS (Traction Control) can suffer from a rough or erratic idle.� Fixing this is not easy, as not all dealers still have the equipment or knowledge to investigate.� Used parts are in short supply and substituting known good units seldom works.� In any event, when a new/used TCS ecu is fitted, it needs to be reprogrammed to suit.� Some specialists known to the author, have scrapped otherwise perfectly good cars because of persistent TCS woes.� There is no obvious answer here, as cars so equipped have a different wiring loom and throttle body to standard. Problems with electric mirrors or window lifters are not unknown and sometimes the resistor block for the blower fan fails, leaving the fan operating only at full speed.� This is more of an irritation than anything else: replacement is quick and relatively inexpensive.� Motors on electrically adjustable (or memory) seats sometimes fail and it is worth checking that the electric seat heaters that are a boon in Winter still work, as repairs are fiddly and really require hog ring pliers to undo the clips that secure covers to the seat frames. One trap for the unwary relates to the washer tank reservoir, which around 1992 was relocated from the passenger side of the car to the driver’s side, partly in the interests of easier maintenance but also to accommodate the fitting of impact sensors for the SRS system.� This means all CS/CSE hatches will be so equipped and CD saloons from 1992.� The tank is mounted behind the front wing on two long bolts, the heads of which are located in hexagonal recesses in the plastic.� Inevitably, movement caused by normal driving can cause leaks.� Repair is awkward as the wheel arch liners and the wing must be removed.� Worse still, the tank itself is a decidedly unfunny �60 or so to buy. �Often, leaks are caused by nothing more than a weeping T piece next to the tank, but it pays to be informed of the ‘worse case scenario’ and can lever a bargaining advantage, if trying to purchase. On the subject of leaks, be not misled by a pool of clear water beneath the car after a run with the air-conditioning (or climate system) running.� One owner known well to the author arrived looking slightly depressed one day clutching a new water pump.� After it was pointed out that the coolant was a health blue colour and that the screen wash tank contained a solution of methylated spirits, our friend was very puzzled until he remembered that his domestic refrigerator produced copious amounts of water too.� Even so, the water pump was fitted, just for added peace of mind on a planned continental trip. Coolant in the cooling system reservoir should look fairly clean and not resemble oxtail soup.� Cars with service histories usually have dealer tags to show when the coolant was last renewed.� Water in the oil caused by a blown head gasket is quite unmistakable: not only will the car be boiling its brains out but the oil will resemble mayonnaise and there will be oil in the coolant reservoir.� This is notoriously difficult to remove, so do not be unduly worried if a potential purchase shows signs of black oil in the tank but the coolant and oil are nice and clean. �In such cases, ask the vendor who did the work and when, for added peace of mind, for it may be that the overheat was caused by a defective radiator (which may not have been changed).� The presence of stickers (yellow background, red border) on the opposite side of the engine bay show when the brake fluid was last changed. Under the bonnet, oil leaks around the cambox gasket on all 9000s are fairly common.� Replacement gaskets are inexpensive and easy to fit.� On V6 cars, however, access is far more difficult, as much more dismantling is required.� Spark plug apertures on the B308 engine (V6) often fill with oil but since the plugs on this engine require changing at 40,000 intervals, this usually goes undetected.� Leaks around the power steering pipes leading to the system reservoir (off-side front inner wing) are often due to loose hose clips. Working around the front of the engine, (2 litre and 2.3 engined cars only) do check that the exhaust manifold studs are present and none are snapped, as these are very difficult to fix with the cylinder head in place on the engine.� More often than not, the studs become wasted and weakened so that hard driving or attempts to remove the nuts from the stud result in snapping. With turbo charged cars offering remarkable power for the money, some will have been driven quite hard.� As a result, items like engine mountings can suffer, although this can sometimes be hard to detect.� The engines are mounted on two (expensive) hydraulic mountings fitted to the subframe on the driver’s side of the car and supplemented by a steady bar (torque arm) with two large rubber bushes on top of the engine.� These are frequently split � replacement is not expensive but a 10 ton hydraulic press was required to change one which failed on the author�s own V6 9000CSE, which has a similar arrangement. On the nearside of the car, the gearbox mounting may be past its best, too.� Excess movement leads to judder on take-off (the right word for a turbo!) and this can, in time, lead to gear selection problems, as the metalastic sandwich joint connecting the gearbox to the gearlever selector rod can start to break up.� It is worth noting that uprated Polyurethane bushes are available for the steady bar torque arms and gearbox mounting, as well as for things like the anti roll bars.� These are available from specialists like Elkparts and Abbott Racing. Even normally aspirated 2 litre cars (135bhp) should be capable of 120 mph+ and 0-60 in just under 10 seconds, whereas turbos are 2 seconds faster with almost 140 mph available.� Normally aspirated 2.3 cars are rated at 150 bhp and although they are obviously faster, the real difference only becomes apparent when towing. Later Eco Light Pressure Turbo (LPT) cars have different gearing for more relaxed cruising and better economy.� The 2litre (B204) LPT engine is rated at 150bhp, whilst the 2.3 LPT develops a useful 170bhp.� Although 225bhp Aeros and Carlssons are very exciting to drive, they incur increased insurance premiums.� All full pressure turbo charged cars have superb mid range acceleration, especially at 70mph and more because the turbo charger is spinning at optimum speed with no delay in spool up time.� This often translates into major embarrassment for tailgating GT Johnny in the BMW and such vehicles rapidly recede into the mirror as the ‘power on demand’ facility is used.� For best effect, remove the turbo badging…� The author has achieved over 30mpg on sustained high speed running (up to 130 mph) in an FPT 2.3 somewhere in Europe, whilst a standard 2 litre injection regularly returned 38mpg on the M1.� In contrast, local town driving in traffic jam afflicted Sunderland brings a 2 litre turbo consumption down to the low 20s, whilst the V6 seemed to return between 28 and 32mpg pretty much all the time, irrespective of the type of use. Colour choice is terribly subjective – even so, the author believes that earlier cars look best in Berylium, whilst CS models really suit Scarabe and Ruby.� The Anniversary in Amethyst is irresistible… Black is timeless (but requires commitment to maintain the lustre) and Le Mans looks great… when clean and polished to a fine shine. � ABS (Anti lock brake system) NB all 9000s have discs on all four corners. � CCS (Climate control system) Set a temperature and the system does the rest. � SSR (Sliding glass/metal sunroof) Power sunroof may/may not be fitted with a/c or CCS. � TCS (Traction Control System) a mixed blessing… later cars are switchable. � Wood kit: many cars have wood fascias but door fillets and console trim were extra. Some parts are quite pricey and the high cost of units like engines and gearboxes means that good used parts command high prices.� Used autoboxes can be had for �300-450 depending on model year, whilst engines can fetch up to �650 for late cars.� It pays to shop around! Oil:� use good quality semi synthetic and change at 6,000 mile intervals or at least once a year! �Do find out the percentage of synthetic polymers: 40% is fine, 5% is the absolute minimumand ensure the oil is to to API/SH or SJ spec BUT check the vehicle history!� Retailers will NOT generally information about the percentage of synthetic polymer, so check the company website!� The author has seen cars that ran perfectly well on semi-synthetic oil start to leak furiously from just about every joint, plug and seal in sight when changed to fully synthetic oil later in life!� Expect to pay �15-40 depending on supplier. Oil filters (use nothing but SAAB ones!) can be had for under �4. Spark plug set (resistor plugs ONLY for Direct ignition) �8.� Use only NGK! 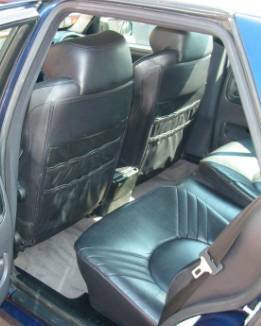 Body panels are quite expensive and pattern parts do not seem to be available.� Coupled with the performance, drivers under 25 may encounter steep premiums when trying to insure turbos.� As with all vehicles, it pays to shop around and it is thought that the SAAB Owners Club has arranged special terms for owners. 3.5� Will it fit your garage?� Will it tow a caravan?� Can I fit a roof rack? Luggage capacity is impressive, even with the rear seats up (22 Cubic feet) but in the case of the hatchback, it is quite easy to fit a mountain bicycle, without removing the wheels when the seats are lowered (56.5 cubic feet).� Hatches are more versatile load carriers than saloons, purely because the 60/40 split rear seat offers more possible combinations of load and passengers.� Of course, a roof rack may be fitted to the 9000� - the mountings are concealed beneath the rubber draught excluder strip that runs along the top of the door frame where the aperture meets the roof.� Such items are pricey accessories but good used roof racks do appear both in the advertising columns of periodicals and within the automotive sections of web sites like eBay (www.ebay.co.uk). For towing, the author recommends the purchase of at least a light pressure turbo-charged car.� It should be pointed out that the additional weight will impose a load on the transmission.� This has implications for cars fitted with automatic transmission in that care must be taken to ensure the Dexron 2 fluid is changed very regularly. The mad 9000 enthusiast is a self-confessed car nut who has spent the last quarter of a century playing with a variety of Aston Martins, Porsches, Rolls-Royces and Mk 2 Jaguars.� Interest in the 9000 as a breed was aroused after observing the high percentage of surviving older cars with few rust problems. �Add strength, performance and build quality for a car that really should be regarded in higher esteem.� Now, more cars than should be admitted to for a sane individual, have been purchased, run and in some cases, stripped to a bare shell.